It has always been tough task to search for stock free or legally free images to use for commercial or personal purposes without raising the flags. But very soon everyone will be able to find images which are completely free doesn’t results in unwanted copyright infringement. Creative Commons is an on profit organization which is known for offering copyright licenses to the creators which enables them get their work used on a broader scale. It does away with creator effective control over how and where their work can be used and what the procedures for proactively attributing the used work in question. Creative Commons efforts are noble and it is on verge of unveiling the a new search engine named CC search which will be make it easier to access image content for users on worldwide scale. There isn’t dearth of image search engine in the online world and some of the notable one includes Google and Flickr. These search engines has for long offered tools which allows users to filter CC licensed images but Creative Commons has finally decided brings its own search engine into the play for wider audience reception. Creative Commons maintains that each month about 60,000 users make use of its site to search for the images but opting for a dedicated search engine will help in moving out of other’s clutches and to reach out to more number of users than ever before. Creative Commons CEO, Ryan Merkley, has clarified that the currently people doesn’t have a front door which brings a wide range of tools for easily accessing images on the go. CC engine will help those users in finding a credible engine as well as tool to curate, remix and share works which are free to be used as per the likes and needs of the specific users. In other words Creative Commons is trying making its vast abundance of works more usable for the wider audience. 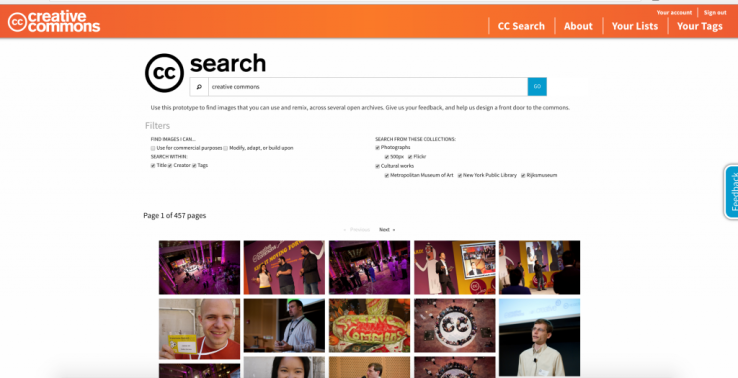 Currently Creative Commons is launching the beta version of CC search engine for the images and on the basis of the feedback generated from the users it will make the necessary upgrades in the final product. This beta version will help them in finding the right mix of features which ought to be implemented on the search engine for better usability. The major things which CC is focusing on include finding the different types of media support and repositories which ought to be brought on the search engine. It will be bringing full range of content from the Europeana collection while a selected subset from DPLA and a significantly large subset from the FLIKR Commons will be offered on the search engine initially. In later phase a number of features will be integrated on the search engine which will help in enhancing the sharing experience as well as mapping user’s preference for better results.